As many as there are stretchered couches that the pyschiatrists and therapists will have you lie on to tell all your problems and dilemmas, there are barber chairs and stools and seating arrangements in barbershops across the neighbourhoods of Nairobi and this African continent. Ng’ang’a is my barber-barber. I might do you well to explain just who a barber-barber is: A barber-barber is a man (or woman, these days) who cuts hair and beards as a trade, and has cut a particular customer’s hair for over 10 years. Like I said, Ng’ang’a is my barber-barber. This man has known me longer than I’ve known him. From hi-t0p fades to ‘Jordan’ to Afro trims, from blowouts to curly-kits and those hair-gone-wrong days he’s been there. I haven’t been to Ng’ang’a’s for over two years, but it doesn’t erase the fact that he’s been my barber-barber for over 16 years. Giving stories as he cuts my hair, barbers seem to have a savoir-faire that’s pretty darn good. And they need it to stay in business. I have countless recollections of telling Ng’ang’a all that was going on in primary school, all the thrills and spills of pubescent life, not realising he was actually becoming a confidant in some way. Ng’ang’a’s was always the place to be in the large neighbourhood, and he moved shop like two or three times, the clientele always remained faithful. Even as his prices went up 200% as he accustomed himself to the new ‘relaxing routine’, that dominates barber-world of haircut, wash, massage, and a rubdown to the head, clientele remained faithful. I can be said to be one of the ones who just moved on. With a barber-barber you don’t move on, you just ‘take a break’; it’s strangely like a marriage. No one knows how to cut your hair like he does. Regardless, when he changed to incorporate the ‘relaxing routine’ I changed too. I like all that jazz, but keep it under 100 or 200 bob for me, it’s just a haircut! Needless to say I’ve found another barber, and if you read about Mbugua and Sam’s breakup. I went to Sam’s yesterday, since Mbugua’s was a little busy, if you consider two people in line busy. I was only going for a cut-which is where he doesn’t cut the hair, but the edges of the hair along the forehead, down to the ears and round the back of the head. Thinking about it, I don’t know why it’s called a ‘cut’ then…Anyways, he did a good job. It was our convo that really got me sure that there is a professor in every barbershop. He always has a story, an analogy or in most cases an allegory -hence my referral to gossip above- to keep the exchange flowing. With me we talked many things, among them death, and passing on, as you’ll find out more in the Thank You post coming soon. And if you pick up a phone call in there, it’s likely you’d be grilled or teased (depending on how the barber feels) and the second-hand speech will be used against you by all means. I’ve been to a couple different barbershops in my days, I’d say, but in life, it looks like you can’t really have that many ‘barber-barbers.’ If you think of it like a marriage, you want it to all work out the first time, and hopefully things get easier, and hopefully better with time. Gents, are you taking lectures and discussions with your ‘professor’? Ladies, is this true for salons? Wouldn’t be surprised if there were similarities. A while back my church had a mission trip to a not-too-distant slum/village called Mji wa Huruma. The slum is located in the Runda area. A sharp contrast to its’ surrounding area, with lush carpeted and trimmed lawns, fountains and yellow-bricked driveways. This is a more humble area, and it’s a village. By village I mean a small community of people who have goings on in, and possibly around, the Runda area. And the dynamic in the village is notable, I would say that possibly 3/5 of the village are children between infancy and teenage years. The mission was simple: For a week, bring the message of Christ: love, forgiveness and redemption to them. Forgotten, almost, by their immediate neighbours, the church’s duty was to bring and show love to all, and to bring ties of friendship to the community. It was business as usual when they first entered Mji wa Huruma, which when loosely translated means the "Village of Pity". An assessment of needs, engaging the youth through sports, and ladies and mothers speaking to fellow ladies and mothers in the village. However, for the men there was also one unique challenge that presented itself. 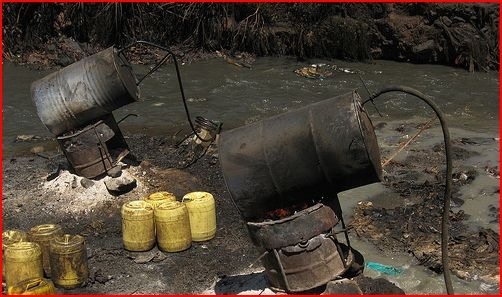 One of the things that goes on in plain sight was the preparation of chang’aa [chah-ng’-aah] which is an illicit brew that’s made and sold within small communities in varying degrees of strength. When I say in varying degrees of strength I mean strenght enough to kill, strength enough to paralyse, and strength enough to blind a man. I might rephrase that to say that it doesn’t occur in ‘plain sight’ but rather since it happens at a valley (it must often occur near a river) it’s never really in plain sight, it’s just not hidden from anyone’s attention. It’s preparation is simple, but very effective. Mastering the age-old technique of distillery, it’s preparation happens by a river. Always. And at Mji wa Huruma it was no different, a select group of men, 4 of them, taking turns every now and again, on an unwritten rota with an unspoken set of rules. Preparation requires a drum, old oil drums made of iron are preferred in this case, their oil-stained insides along with their rusty charred exteriors are perfect, and they conduct heat well. The drums are then cleaned out, or not. But usually an effort is made to ensure that they aren’t poisonous, but not in all cases. The oily cask is placed by the river, and stands on a custom-made holder comprised of yet more old iron, or stones, it sits on a tripod of sorts; one that will remain unburned, but can take some heat. Old, metal seat frames are used at times. This is what supports the drum as it’s put upright. Once balanced and supported, the drum is placed a slight angle toward the river. Below it is what ought to be a perpetual flame, and an array of items can be used, some being more harmful than others such as plastics or other inflammable objects being burned to keep the heat on the base of the drum. From old foam from retired mattresses, to garbage, though wood is of course the preferred kindling of choice. Next, the drum needs contents, the contents that form this wicked concoction vary, but the staple ingredients are usually water, sugar and yeast. The variables include the oil in the drum and what possibly is the most devastative and corrosive element: embalming fluid. Either embalming fluid, or embalming powder, call it what you will. It’s effect is just as potent. Oh, and I might just mention, that this is what is known to be in the nefarious potion. No one can know what it doesn’t contain if you catch my drift. It is usually served in small (or large doses) about a glass that goes for Ksh. 10 or Ksh. 5, 15, 20. You might have wondered at some point about the police. WE’ll they’re in on it. They come down the hill to the bottom where the brew is being boiled and brewed, and as if to literally add fuel to the fire, they pick up a bribe, give a smile or two and leave. This was witnessed unashamedly by our team. I did hear, though, in fairness to them, that they came through the place sometime and shot up the drums that make the chang’aa. As I wrote this post, someone asked me, Mark what is the purpose of posting such information, intricate and detailed as it is? I answer him in the same way I would answer you if you asked me the same. I write this not so I can condone, glorify or justify the creation of such, but if in some way we can provide a sustainable solution, I know people working in places where it has been hard to reverse the culture of such a mind numbing drink. What I may not have mentioned here are other examples of people who’ve given more to see people work themselves out of this. The work of another good friend of the church, Dr. Ndung’u who not only pastors and leads a church in Ruaraka, but he also practices dentistry there and treats and heals the physically and spiritually sick, so to speak. Or perhaps of the projects going on in churches in and around peri-urban areas and areas afflicted by poverty e.g. goat-rearing, livestock farming and even rabbit-keeping which, along with the Gospel, and great follow-up, has seen men deep in the chasm of such alcohol freed and released with mighty testimonies. I challenge your thinking to give me a way around this practice in some way, something that I could propose. Your comments and musings are appreciated. I had the honour of christening my barbershop in South B ‘GoodLook Barbershop’ this evening. My barber- Mbugua was one of the hundreds of people affected by the government’s amazingly orchestrated demolition scheme in South B. Destroying all standing structures on the ‘Road Reserve’ their tact was simple but effective. Tuesday whilst collecting occasional bribes and mingling with the residents they hear the familiar jibe “We’re coming to bomoa (demolish) you guys next Monday, you know.” Amidst banter, negotiation of kick-backs, and such. They came that very Friday, and didn’t leave a single standing structure, save for the Container turned Shop outside Zanzibar Lane, and the Butchery – They had to really jitetea ( plead their case) with meat that would go bad, fridges, and other amenities. So they stood, and I came that evening to find my barber Mbugua gone, his partner barber Sam gone and Mbugua’s mentor, and probably the most popular barber in South B- Kinyash gone. Sad, and with a gruff, hairy face I went my way. I enjoy getting cut at the barbershop. It’s a social thing I guess in its own way, with witty discussions and all the repartee of a salon, this is the testosterone-filled equivalent. So, it broke my heart the next morning to come and find Sam and all the other people affected by the demolition. They had a little protest march. I got glimpses through the white gates of Zanzibar Lane. I met him at the matatu stage and I told him to stay strong. I promised that if he set up again that I would pass by and ‘promote’ him and Mbugua- they had been partners at this barbershop for little more than 8 months. But Sam’s brother is the one who owned the business. I came this evening, they had electricity, but alas, Mbugua and Sam who were the tag-team that formed ‘Lucky Barbershop’ were no more. They were together but in separate shanties. A shrewd lady had actually demolished her own wall, built up shanties and was to rent out these kiosks to the previous owners, at twice the price of the rent. She was now renting it out at Ksh.7000 a month, that’s around $90 a month. Meagre it may seem, but imagine paying that from when you paid around $30 a month. It was a leap, but like in any business, Mbugua and Sam stuck to their individual guns and would stick it out. So I pass by Mbugua’s and it’s barely complete, he just got the electricity done, two fluorescent lights strapped hastily across the mabati roof. It’s 8:30 PM, the eerie light bathing the piles of sand and ballast outside his barbershop. I see the words ‘Barber’ painted in a fading red, probably the something oxide used that morning to make sure edges of the mabati doesn’t rust. And I get my cut. And yes. It’s a good look. But in between our conversation there’s the feeling that he’s going to have to really compete with Sam on this one. I haven’t been into Sam’s, but I can even feel that Mbugua’s clippers aren’t as sharp. My hair doesn’t give him any problems, but if I had nappier hair I wouldn’t be smiling. Sam’s also has music, the radio plays and leaks into our stall. It’s got some bass so I know he’s got something decent on his side. I look at Mbugua’s side and I see a speaker with wires showing while it sits on top of a wood base around a foot and a half off the ground. ” We’re going to do it big this time,” he says “I’m going to get a DVD (LCD Screen with a Video CD Player) and I’m going to play whatever my customers want.” So if I’m feeling a little mellow that day, he’ll play me some blues as I get my cut, or some reggae to ease my soul after the troubling day. Good Look is on it’s way to looking better. Let’s hope it works out for him. Mbugua’s got dreams, and God know we all do.